They were just so pretty! Breakfast at work is usually a mixture of gluten free muesli and soy yoghurt, made the night before so that the oats and dried fruit soften beautifully. I thought it would be such a treat to have baked apricots to add to it this week! 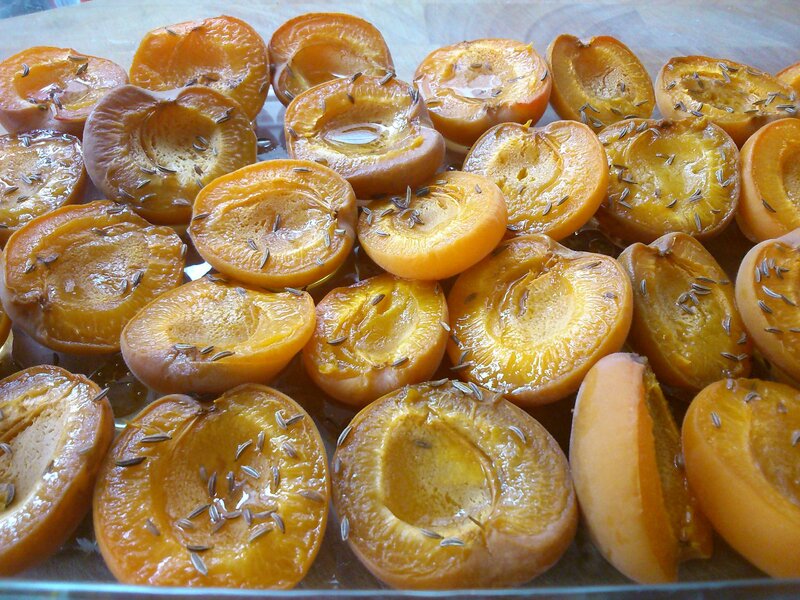 The apricots were a bit sharp, so I drizzled them with a little maple syrup, and added caraway for spice. Halve the apricots and remove the stones. Arrange them cut side up in a baking dish in one layer. Drizzle the maple syrup over them, making sure to get a little on each piece of apricot. Sprinkle the caraway on top. Bake for 15 minutes, until softened and fragrant. So pretty! I would never have thought to season them with caraway, sounds delicious!